I went down to the local club yesterday and got a test game in with Nick. Who's followed the project off and on since its inception, but who hadn't actually gotten to play a test game yet. Since this was Nick's first game of WarStrike, we kept it fairly simple. With a Meeting Engagement mission and mirror forces of 7 units each. Ok, we really need detailed mission briefings. Because we forgot to place the player-deployed obstacles that this mission really needs. We've been needing this done for a while, I just haven't had time. I can write up a detailed outline for the setup sequence easily enough, and provide the deployment diagrams. Would someone else like to take point on writing up the detailed descriptions of each mission? As discussed previously, I split up the combined 'Action Phase' into more traditional Movement & Shooting phases. As expected, this felt very natural. The sequence we started playing with only had you roll suppression during the reaction phase. 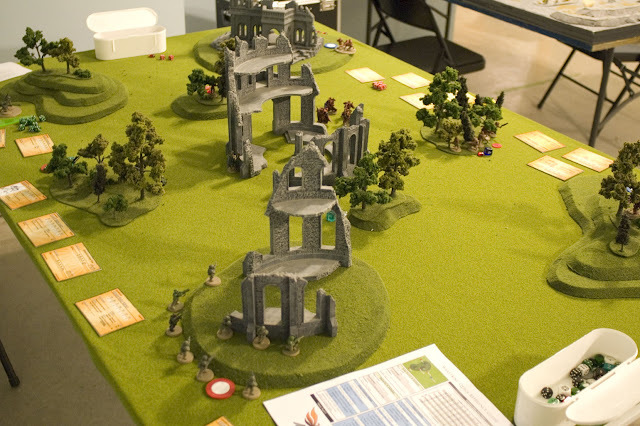 But mid-game we decided that you really needed to be able to roll at the beginning of the movement phase. Or else you got pretty discouraged when you couldn't do anything with a suppressed unit. A nice side-effect of this is that you got to clear suppression (or GtG/Fall Back) twice a turn. Which seemed really well balanced with the extra shooting and non-reduced RoF on all weapons. Though I did note that the extra nerve marker discard for not being suppressed might have to go under this sequence. Or that we might need to add an extra suppression marker for the first casualty in addition to the first armor penetration from a salvo. Since we were clearing so much suppression per turn. Ok, the big change here was in shooting. Since in the shooting phase, only static units could shoot. Advancing units would have to wait until the opponent got to shoot back before they could fire. Which was the idea from Squad Leader that I wanted to try out. 6.5 Continue Combat Until One Side Is Victorious. 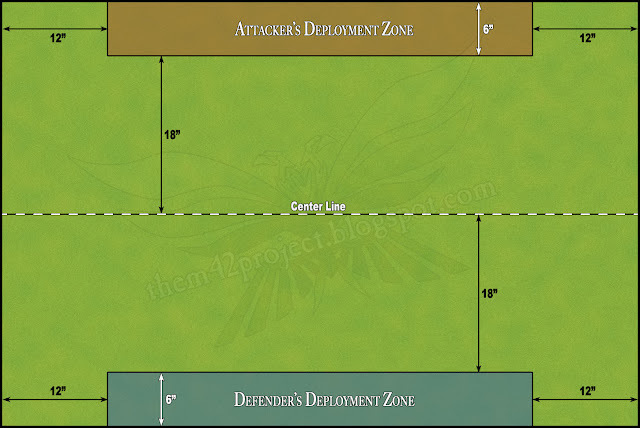 6.5.1 If Attacker Won Combat, They May Make Free Consolidation Move. For simplicity, and because of Eriochrome's misgivings, I left close-combat alone. Neither did I sandwich it between the reaction and advance phases, as I'd originally suggested. The good news is that this sequence was REALLY fun, and both Nick and I loved the back and forth of it. We had one case where my Lieutenant ran up behind a ruin (you can see him in the pic up top), and Nick's commander came around the corner to shoot him up. My commander was able to fire first and suppress him (Reaction Phase). Then Nick cleared his suppression and shot my commander (Advance Phase), suppressing him right back. Then I cleared my suppression (my Shooting Phase) and shot him again, killing him. It was very dramatic, and it was quite easy to visualize a 'movie' version of that, and other, moments. But there was a deal-breaking downside to this new sequence... time. We only played about 4 or 5 turns before Nick conceded. But the game took just over 3 hours to play. Previous test games have taken an hour to an hour and a half to play. Not good. So as much as I like the sequence, I think it's going to have to be kicked to the curb. Or else our little platoon-based game will take just as long to play as a game of 6th Edition 40K. We'll have to see how the split movement/shooting phases by itself affects game time in our next few tests. There was also the issue of the defender's free GtG preventing it from firing during the attacker's first reaction phase. Though whether that would really be a problem is up to debate. 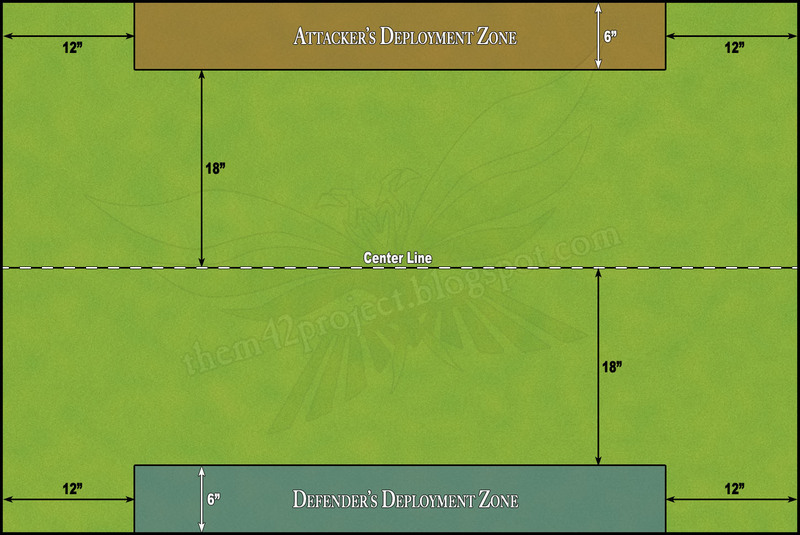 Since it let the attacker have his pick of positions mid-field. The exposed/obscured/concealed/hidden visibility system worked very well in practice, as before. Nick loved the 'tactical feel' of having limited visibility. But he had a lot of trouble remembering the 3 different 'short' ranges. So for simplicity's sake, I'm going to seriously consider going back to 'Awareness' as a unit characteristic that doesn't change based on cover level. But keeping the +1/+2/+3 for shots beyond that range. When you fall back, and how far, needs to be more strictly defined. We wondered whether an officer (or other single-model unit) within coherency of a friendly unit should be suppressed right along with that unit. There was also the question of what status a unit that clears its suppression during the reaction phase has. Does a unit that didn't move (and therefore gets firing bonuses) then count as moving? Probably it would, just because I don't want to have to have counters to keep track of who did what. Do Base Sizes Really Matter Now?